A fitting photo for the last day of April 2009. This is the back of our house toward the end of the month, after we got the lawn furniture out. We had lots of outdoor weather this month and enjoyed the back yard, mostly working: pruning, weeding, and tilling. Callie sitting in the shade of the umbrella. That round brown patch on the lower left is what remains of a tree stump. I'm hoping to re-grade and seed it soon. But we also did a lot of sitting, sipping, and playing with Callie. Here's hoping for a good month of May so we get the rest of the vegetable garden planted. Also on our list for the summer: cleaning parts of the house exterior to get rid of some dark stains (the house was once covered by vines), painting the window sills and that white band around the bottom of the house, sanding and re-painting the shutters on the garden shed, removing a dying apple tree from the yard, and continued maintenance on the vegetable garden. 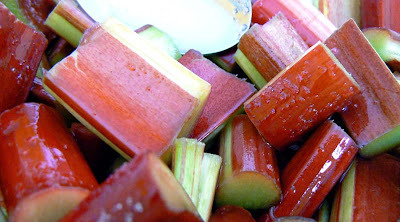 We're lucky to have a small rhubarb patch in the garden and that it produces a couple good crops each year. When we moved into the house, the rhubarb was not doing so well. I read that every five years, or when the stems are staying spindly, that it's time to divide the plants. Trimmed and washed in the kitchen sink. Well, our rhubarb certainly had spindly stems. So I dug them up, divided the rhizomes, and relocated them into what was supposed to become our perennial herb garden (that's another story). The first year, they didn't do very well at all, which I understand to be normal. Peeled a bit, cut into sections, macerating in sugar. But the second year they put up some very respectable stalks, and have done very nicely since. We'll be coming up on the five year mark in another year or two, so I'll have to keep an eye on them and decide when to divide again. The finished pie. Not a thing of beauty, but tasty, nonetheless. 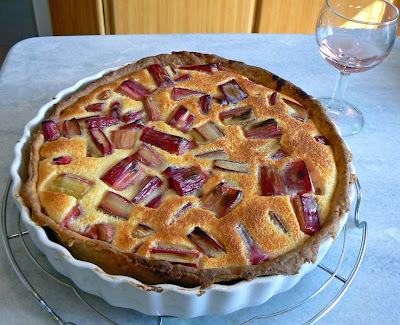 Springtime is rhubarb time and I've made one pie already. 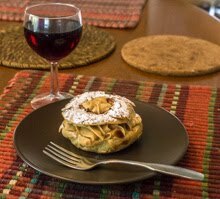 It's not the American two-crust version; it's a French recipe that uses a sweetened egg custard to hold the fruit together. 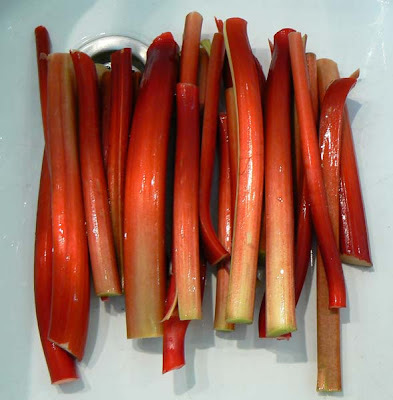 The rhubarb is trimmed and macerated in sugar before it goes into the pie. This is a little late since most of the blossoms are gone now. But during my two week run of Paris photos, I did manage to take some shots around the house and yard. Better late than never. I love the subtle pink shades. 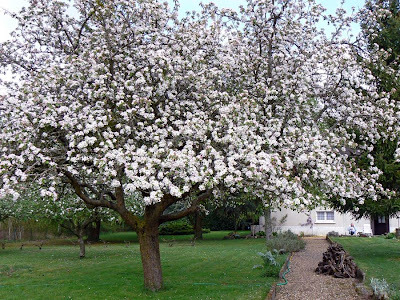 We have five apple trees in the yard. Each is a different variety. But I have no idea which varieties we have. The smallest tree is dying and I'm planning to take it out this year. But the biggest tree is still going strong. The big tree in all its glory. It gives us so many apples that most of them go into the compost pile every year. Every other year the tree produces more apples than I've ever seen on a single tree. This year will be one of those years. 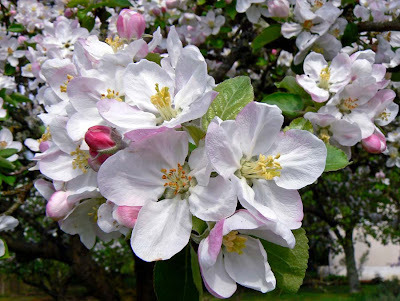 Starting in mid summer and through the fall, the ground will be littered with thousands of fallen apples, all of which have to be picked up by hand each time I want to cut the grass. It gets to be a chore, but it gets us outdoors and Callie enjoys chasing a thrown apple or two across the yard. I've seen her chomp into an apple and eat the whole thing, core and all. 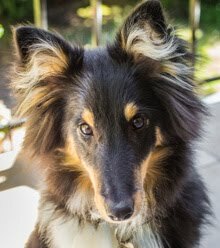 And sometimes I'll find a dried and shriveled apple under the couch, one that she obviously sneaked into the house but that got away from her. April has been a great month, weather wise. We've accomplished a lot in the yard and vegetable garden. And even though there is still much to do, it feels good to get out there and see some real progress as opposed to being cooped up by cold and wet weather thinking about what needs to be done. Callie also enjoys the outside time. 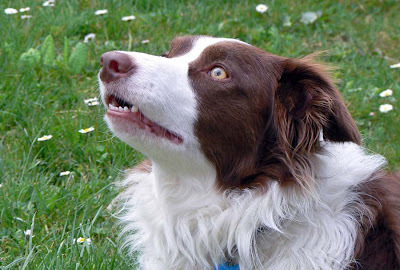 She loves sitting and rolling in the grass, chasing the occasional tossed ball or frisbee, and keeping her eyes on the birds and kitty-cats that frequent the yard. She always has a smile on her face when we're outside in the sun. When will he stop with the Paris posts? I can hear you asking. Today's the day. These are the last of my photos from my mere forty-eight hours in Paris over two weeks ago. And they're taken in the very center of the city: the island called Cité. Notre Dame de Paris seen from water level. 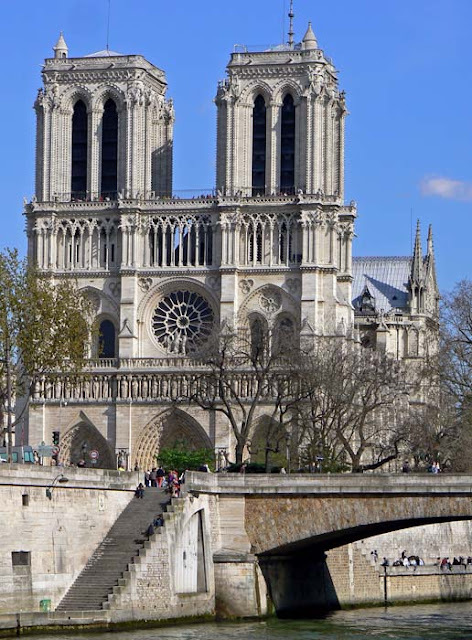 The most recognizable monument on the island is, of course, the cathedral of Notre-Dame de Paris. 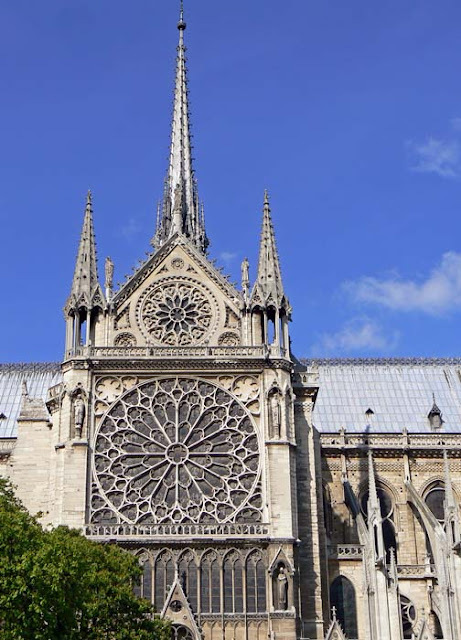 It's a splendid example of Gothic cathedral architecture in France, although certainly not the oldest (Sens), longest (Amiens), or tallest (Beauvais). The cathedral's transept from the south. You can climb up into the towers of the cathedral for terrific views, if your legs will carry you. Or you can descend into the crypt below the parvis (that open space in front of the cathedral) to see artifacts and building foundations from the time of the Romans through the Middle Ages. The first inhabitants of Paris, Gaulois fisherman, settled the largest of the river's islands over two thousand years ago, before the Romans entered this part of France. 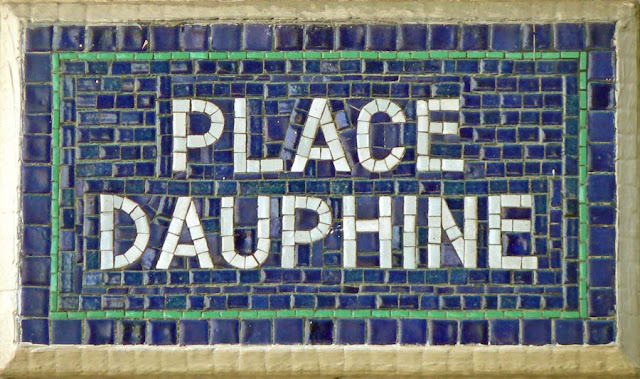 It is thought that the city's name is derived from name of this tribe: the Parisii. The Romans called the city Lutèce. Buildings on the Ile de la Cité. The island we know today is a conglomeration. There were originally up to seven islands in this part of the river. Parisians filled in the shallow parts of the river over time to conglomerate the land into the two islands, Cité and Saint-Louis. To the north, on the right bank, the river flowed into marshy lands, which were also improved with fill to become the neighborhood now called le Marais (French for marsh). Henri IV, le Vert-Galant, and la Samaritaine. 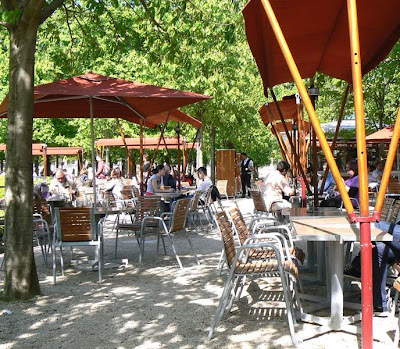 At the downstream tip of Cité is a green park, a favorite spot to sit and enjoy the views or have a picnic, called le Square du Vert-Galant. 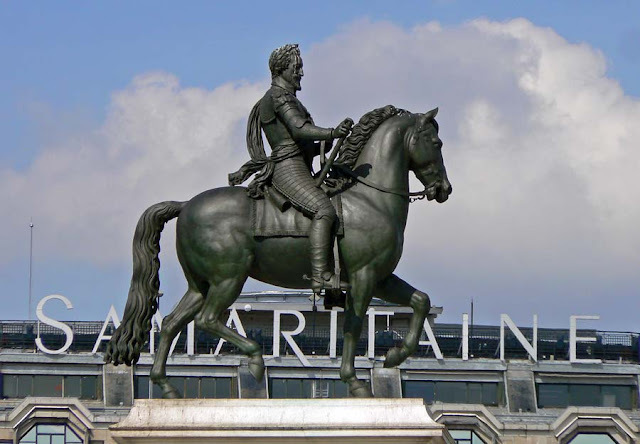 At street level is the bronze equestrian statue of king Henri IV (whose nickname was le Vert-Galant), which faces upstream and into the Place Dauphine. Henri IV was responsible for developing this part of the island, creating the triangular place and the brick buildings that surrounded it. On the north end of the Pont Neuf, which crosses here, was once located a pump house that supplied the Louvre palace with water. 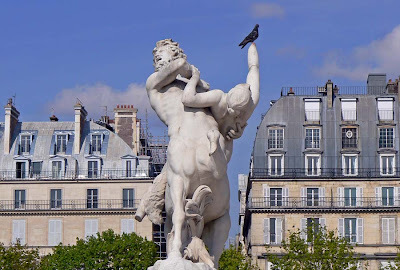 The pump was called the Samaritaine, after the story of the samaritan that once gave Christ a drink. The pump was dismantled in the nineteenth century, but its legacy lives on in the name of the large department store (now closed) on the right bank opposite the tip of the island. La Place Dauphine with Henri IV in the background. The island is also home to the Conciergerie (famous for housing Marie-Antoinette during her trial), the Palais de Justice (France's ministry of justice), the Hôtel Dieu (a hospital), Paris police headquarters, and the high Gothic Sainte-Chapelle. There is so much history on the island that it would take a rather large book, of several volumes, to tell it all. A dog and his ball. Another curiosity, and one that I didn't visit this time, is the flower market on the north side of the island. It's worth a look, even if you're not in the market for flowers or plants or even birds, which are sold there on Sundays. 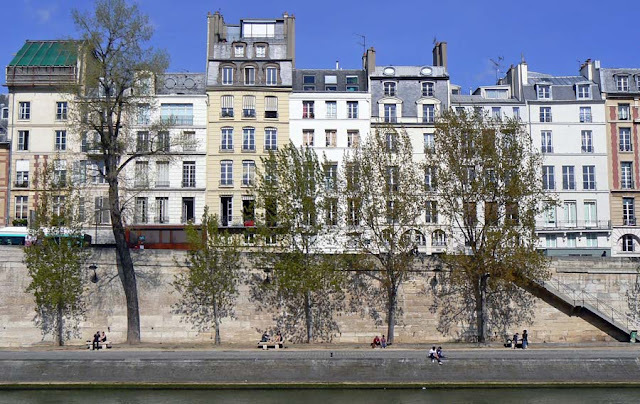 But I did take a walk through the Place Dauphine and along the Quai des Orfèvres, where I re-crossed the river and went back down to the berges. From there, I walked a bit more before heading back up to street level and over to my hotel to pick up my bag. By then it was five o'clock, so I walked over to the train station, had enough time for a glass of wine, and boarded the train for home. 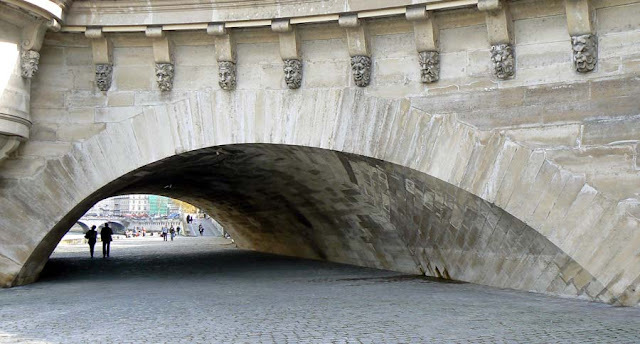 Le Pont Neuf (the new bridge) is actually the oldest bridge crossing the Seine in Paris. Construction was begun in the late 16th century and completed in 1607. The bridge connects the left and right banks at the downstream tip of the Ile-de-la-Cité. Le Pont Neuf and Ile-de-la-Cité seen from the Pont des Arts. It was the first bridge in the city that was not covered, that had sidewalks, and that included its now trademark semi-circular "balconies" once used by merchants and artisans as sites to set up boutiques. Today, after a years-long restoration, the bridge looks almost new again. Cleaned stone, restored carvings, and new lighting combine to make the bridge stand out when seen from a distance. Under the Pont Neuf on the left bank. I crossed the Seine on the bridge just downstream from the Pont Neuf. 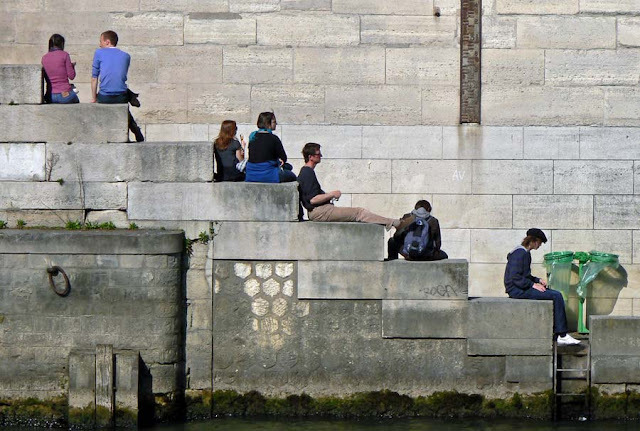 Once on the left bank, I took a stair down to the berges (embankments) a level below the street and close to the water. This way I could walk under the Pont Neuf and a few other bridges before heading back to the hotel for my bag. A semi-circular "balcony" on the bridge. As I said, the day was sunny and warm, and of course, I was still encumbered by my winter coat and scarf. But I made the best of it, not walking too fast and stopping frequently to take pictures. That's how I've been able to stretch this day out into so many posts! 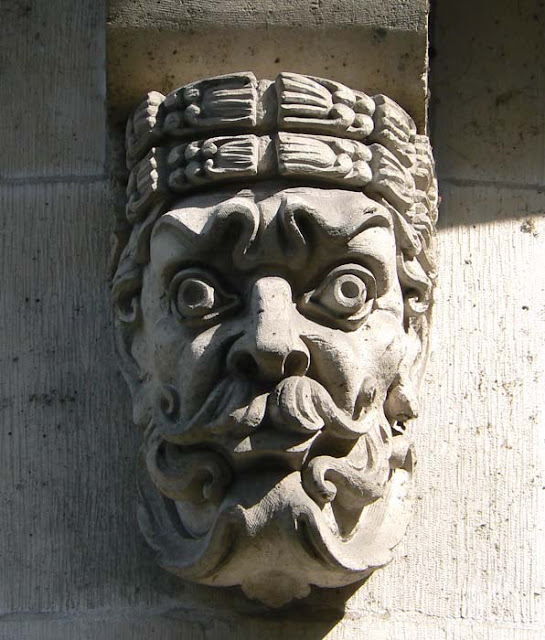 Close-up of one of the 385 "mascarons" that adorn the bridge. 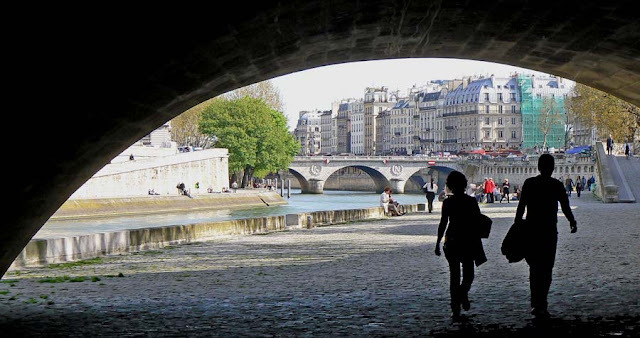 I had planned to continue walking along the riverbank this way, but once beyond the Pont Neuf, I decided to go back up and cross over to the island and walk through the Place Dauphine. View of the Pont St.-Michel from under the Pont Neuf. 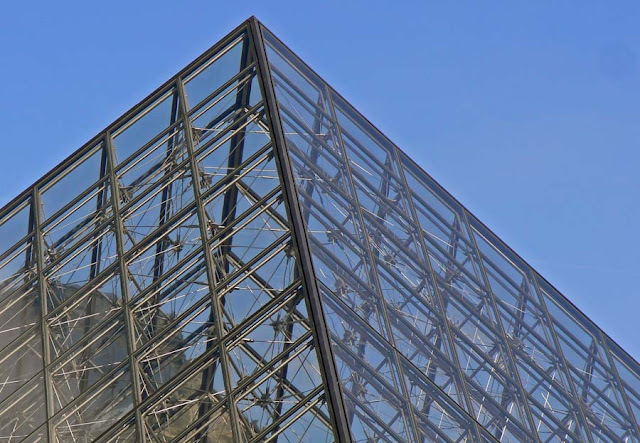 I can't walk by the Louvre without paying homage to Mr. Pei, the architect of the famous pyramid entrance to the museum. When I first lived in Paris in 1981, the museum entrance was tucked away in a corner of the courtyard, which doubled as a parking lot. The only way to find it was to look for a line of people waiting to enter. The entrance to the Louvre museum in the Cour Napoléon. Today, cars are all but banished from the Cour Napoléon. 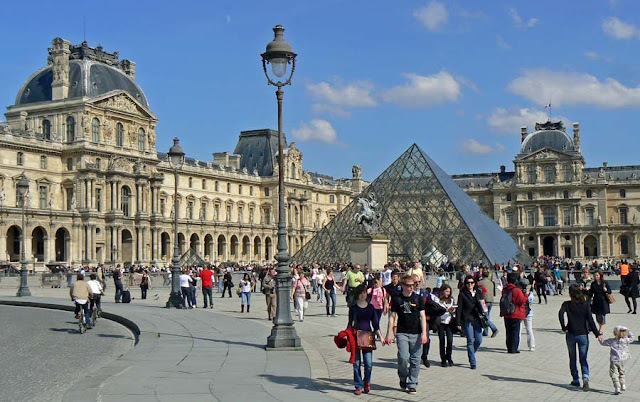 The pyramid and fountains around it clearly mark the entrance to the museum, even from a distance. The façades of the old buildings have been meticulously cleaned and restored. The overall effect is majestic. Quite fitting for a former royal palace, I think. The courtyard brims with activity, none of which is impeded by the line of museum visitors waiting to enter. There's a café under the arcade of the Richelieu wing to the north. People sit or lie in the sun on the sides of the angular pools around the pyramid. They gather on the steps up to the passageway to the Cour Carrée for photos, or a quick snack. I walked through slowly, snapping a quick shot now and then, and made my way into the Cour Carrée. I remembered that just under my feet lie the restored foundations of the Louvre castle of the middle ages; Ken and I visited that part of the museum many years ago. 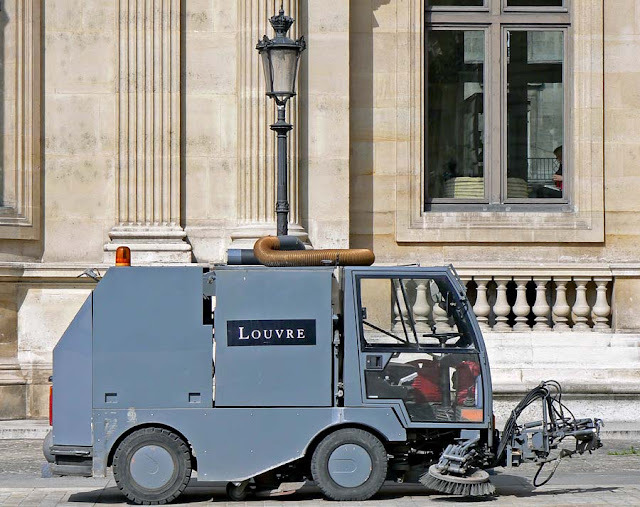 Every courtyard should have its own cleaning machine. 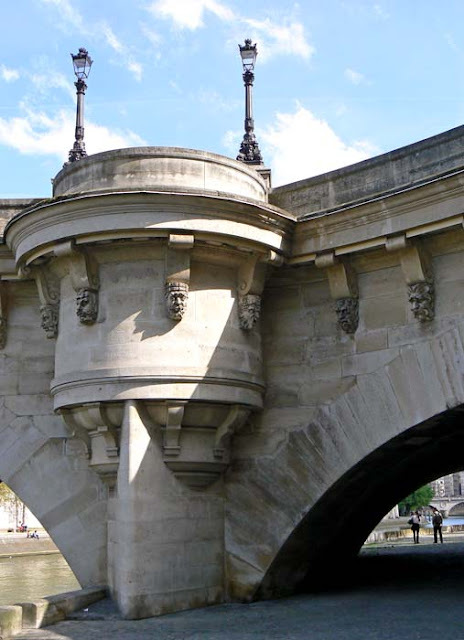 I made my way through the Porte Champollion, which gives out onto the river and the Pont des Arts. 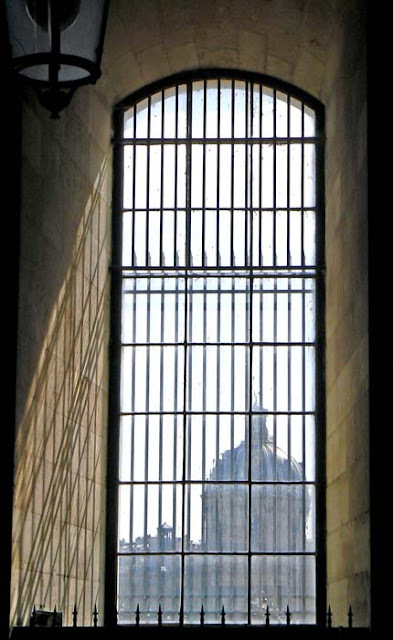 Through one of the glass windows I caught a glimpse of the Institut de France and its dome. I passed through to the bridge and left the Louvre and the right bank behind me. I exited the métro at Concorde and came up on the rue de Rivoli. 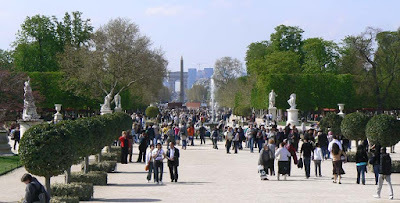 The first entrance into the gardens was right next to the Jeu de Paume. The sun was really warming things up and there I was, still in my winter coat and scarf. 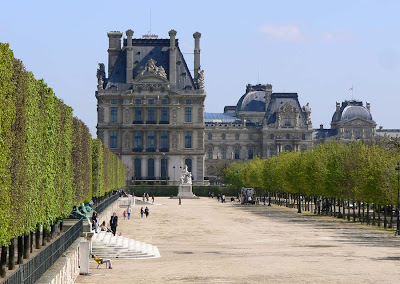 Le Pavillon de Marsan, a wing of the Louvre, seen from the Tuileries. I walked slowly and took some photos, then sat down in a chair for about ten minutes to soak up a little sun. I thought about going into the Jeu de Paume, using the museum pass, but the exhibit they had didn't really attract me as much as the brilliant weather, so I walked on. There were so many people out walking enjoying the space and the weather. Almost every other voice I heard was speaking English, and mostly American English at that. I thought that money was tight these days? Beautiful sky with leafy tree. I was kind of surprised by one guy who was standing next to some riding ponies with his wife and daughter. The pony guy was off having a smoke, but came running up when he saw the family there. The father pointed to his daughter and asked, in English, "Is she big enough to ride one of these?" No "excuse me," no "bonjour," no "parlez-vous anglais." He just assumed that whomever he talked to in Paris would understand his English. And, of course, the pony guy answered him back in English. Gotta make a euro, after all. Lots of pigeon roosts statuary in the park. But still. It doesn't take much of an effort to muster a little "bonjour" before you dismiss someone's language in his home country. They must sell little phrase books at Borders or Barnes & Noble or wherever people do their guidebook shopping these days. Or at the very least, something could be found on the internet that would help one sound just a little polite in the country one has chosen to visit. But apparently not for this guy. Looking back toward the Arc de Triomphe. Oh well. It's a losing battle, I know. I continued my walk until I passed one of those unbelievably expensive rip-off cafés in the park. I was thirsty, so I sat down and had a Perrier. I won't tell you how much they charged me for it. But it was refreshing and worth it. One of several cafés in the garden. Before I left for Paris, I had arranged a lunch date with fellow American ex-pat blogger, l'Etrangère Americaine. 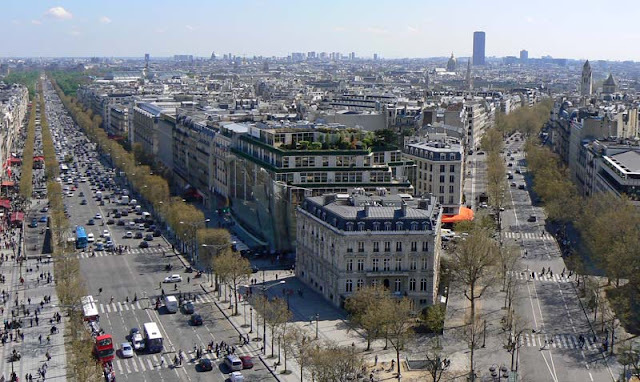 We were to meet at 12:30 on Thursday over near her office, just off the Champs-Elysées, and go from there. So I left the Jardin des Plantes, walked over to the Gare d'Austerlitz, hopped on the métro to Bastille and transferred to head out to the Champs-Elysées. On the left, the Champs-Elysées. 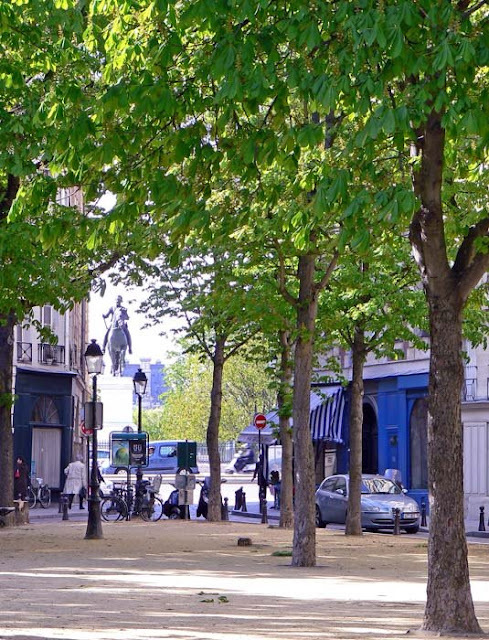 On the right, Avenue Marceau. Casa Luca is where you see the orange awning on the lower right. I was a bit early, so I got off the métro one stop before mine and walked the rest of the way. The day had turned sunny and the temperature was incredibly pleasant. Of course, I was wearing my winter coat and scarf and it was more like jacket weather. Place de la Concorde and the Louvre at the foot of the Champs-Elysées. 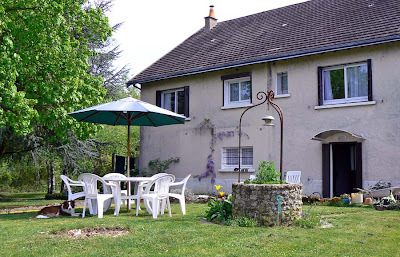 I met l'Etrangère Americaine at the agreed-upon rendez-vous point and we headed to lunch. The place she had in mind had a line out the door (I'll have to try to go there some time), so we engaged Plan B and got a table at Casa Luca at the top of Avenue Marceau, almost at the foot of the Arc de Triomphe. We had a great time getting to know each other a little, exchanging expat stories, and enjoying a delicious lunch. I had a plate of gnocci in a cream sauce with halved cherry tomatoes, fresh basil, and shaved parmesan, and L'Etrangère had a mini pizza. The basilica of Sacré Cœur in Montmartre. Lunch went by too quickly and L'Etrangère needed to head back to work. We said good-bye and promised to meet up again, either in Paris or in the Loire Valley, and I walked over to Arc de Triomphe. I still had this valid museum pass burning a hole in my pocket, so I figured that, given the beauty of the day, a trip up to the top of the Arc was in order. Eiffel Tower on the left, le Front-de-Seine on the right. 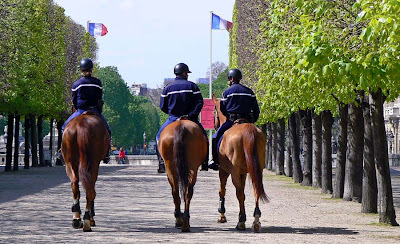 As I made may way through the tunnel under the Place de l'Etoile, my hopes were a bit dashed by the lengthening line of people waiting for access; it stretched halfway through the tunnel. I continued walking, past the ticket windows and up onto the Place at the foot of the Arc. I noticed that there was no line at the entrance to the Arc itself, so I walked in, flashed my pass and was welcomed in. No waiting! Notre Dame on the left, le Panthéon on the right. The spectacular glass roof of the Grand Palais is in the foreground. Of course, I had walked into the entrance for the stair instead of the elevator, so I climbed up the 247 steps to the top. I only had to stop for a rest once on the way up. 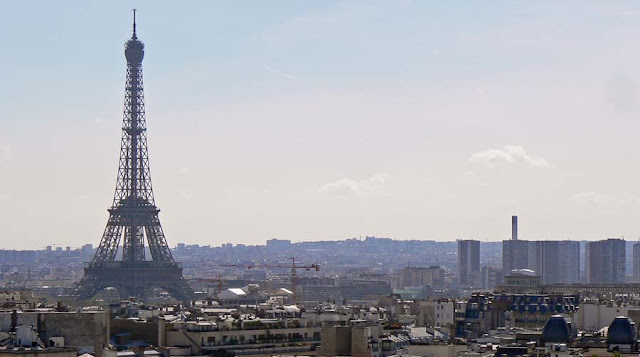 My effort was rewarded with some of the best views of Paris you can get. I must have taken about twenty photos of the view, but curiously, I took none of the Arc itself. 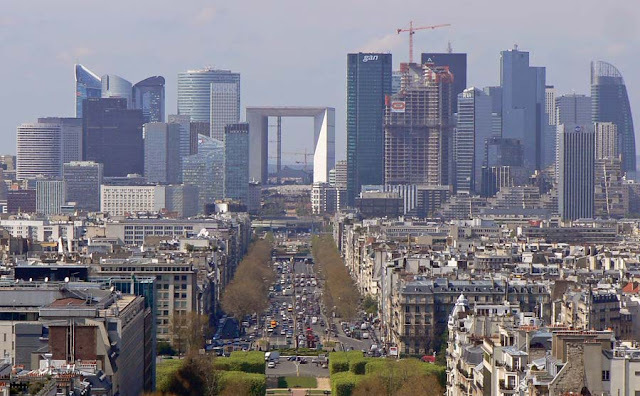 Le quartier de La Défense and the Grande Arche. After walking around the roof at least twice, I had to stop and figure out what to do next. My train was at six, and I needed to get back to the hotel and pick up my bag before going to the train station. I decided that, given how the weather was getting better and better, I would walk back to my Latin Quarter hotel. I took the stairs back down to street level, ducked into the métro, and rode the few stops to the Place de La Concorde. The alpine garden. I passed through the little tunnel and found myself in a garden that was a half level below the ground around it. Curious that a garden for mountain plants would be below grade. 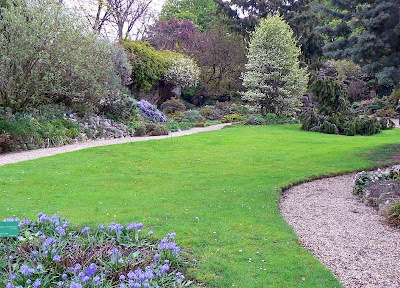 Part of the sunken alpine garden. I suppose it was done this way so that the gardeners could build up the edges with rock beds and little cliffs without imposing on the aesthetic of the larger gardens all around. The effect was one of intimacy, and the only sound I heard was the chirping of birds. This garden was more English in style, in stark contrast to the regimented French garden that I had just left. 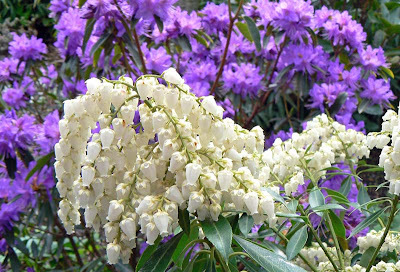 Mystery #1: purple and white flowers. 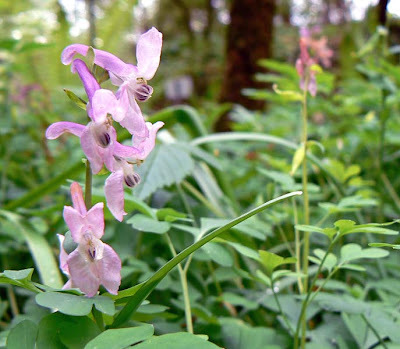 I wandered around a bit and noticed that many of the plants and flowers in the garden were examples of some that we have in our own back yard. Grape hyacinth, various sedums, and other little green and flowering plants. 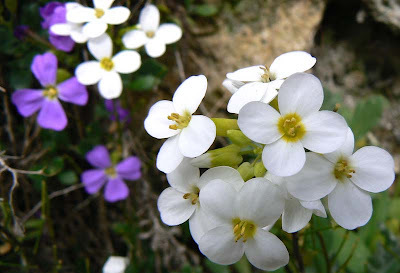 We hardly live in an alpine region, so I suppose that people domesticated many mountain species for home gardens, and some of them have naturalized in their new environment. Mystery #2: looks like some kind of orchid. A few other people were quietly walking around the garden; one elderly lady sat on a bench reading a newspaper. Two gardeners worked on weeding out a section. I was the only person taking pictures. 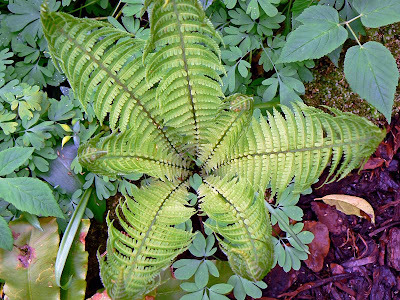 Mystery #3: a fern! But what are those green plants beneath it? I couldn't stay very long, I had to make my way to the métro and head across the city for my lunch date. I think I spent about twenty minutes in all in the alpine garden, and it was quite a pleasant surprise. Mystery #4: hells bells, some kind of lily? I made no attempt to record or memorize the names of these plants pictured here, even though most of them were meticulously labeled with little metal signs. If any of you out there know what they are, I'd love to hear from you in the comments! 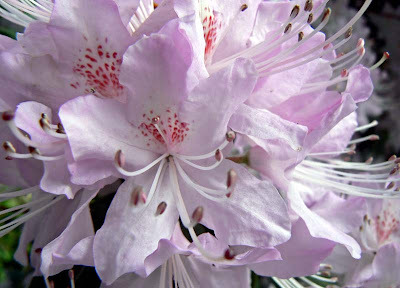 Mystery #5: a rhododendron, perhaps? Poppies. Thousands of them. I don't know if they're there every year; maybe some of my Parisian readers can tell me. 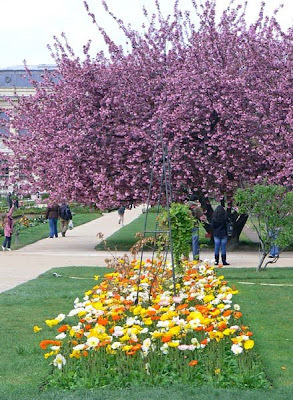 The formal garden at the Jardin des Plantes is certainly filled with them this year. 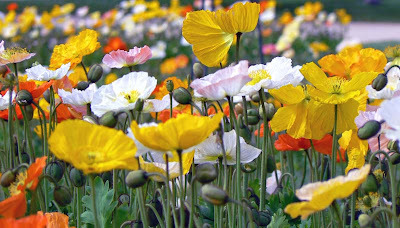 Poppy beds in front of the Grande Galerie. 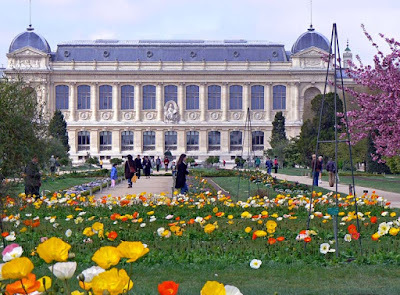 This part of the garden is the "front yard" of the Grande Galerie de l'Evolution. 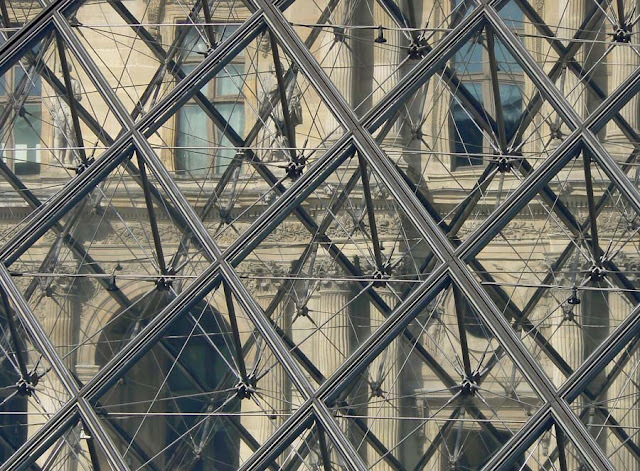 In very French style, its allées and parterres are laid out in rigid geometric patterns. The effect is wonderful. 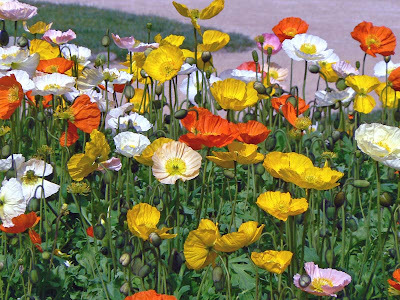 And there aren't just poppies, of course. There are many other beds planted with many other flower varieties. 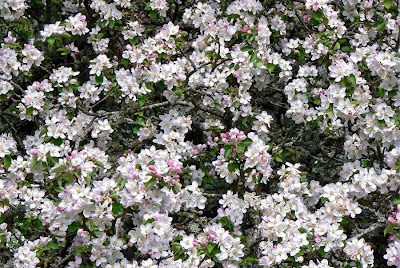 Not to mention all the shrubs and trees in various states of bloom. Along with this formal space, the Jardin includes a rose garden, a collection of large greenhouses, a ménagerie (a small zoo of sorts), and something they called l'école de botanique, where I suppose either garden students work or experimental plantings are done. I walked through the école de botanique, but most of the beds were being dug, amended, or having a re-fit of their irrigation systems done. I couldn't resist just one more. However, just about in the middle of this little garden, I noticed a small sign pointing to a pedestrian tunnel that said, "le jardin alpin, this way." I was intrigued, so I walked through. The moment arrived, albeit a bit slowly. The line to pay to get into the natural history museum was not long, but all the people ahead of me took their sweet time. They all had special questions, special requests, or special circumstances. Talk, talk, talk. La Grande Galerie de l'Evolution, seen from the main entry to the Jardin des Plantes. There were two registers for paying the entry fee*, but everyone made one line. Then all of a sudden, the people at the end of the line made a second line, effectively cutting those of us in front off. Cutting in line in France is an art form. If you dare to cut, it's your right to do so. As far as queuing goes, it's every person for himself. And while everyone will huff and puff, no one will actually do anything about it. This goes for grocery stores, train stations, you name it. The main hall seen from the upper levels. Finally, it was my turn to pay. I said, "One, please." Bam, bam, I had my ticket and was off. Why do my transactions always take two seconds, while everyone else's take five minutes? No matter. Through the turnstile I went. I had seen a report about the museum's renovation on t.v., so I had a vague idea of what I was going to see. The parade of large animals is an impressive sight. I was incredibly impressed with this place. 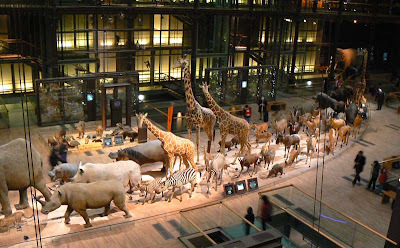 I love natural history museums, science and technology museums, and the like. I'm as intrigued by the buildings that house these institutions as I am by the exhibits, and this building did not disappoint. 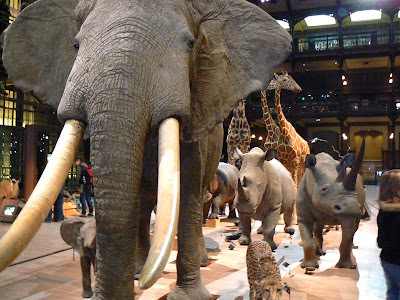 As I entered the main hall, I was met head on by a virtual stampede of large animals: elephant, giraffe, wildebeest, zebra, tiger, and rhinoceros, just to name a few. Surrounding them were smaller groupings of smaller animals, and cases of mounted butterflies and insects. You can walk all around, seeing the animals from all angles, but I think touching them, while entirely possible, is not allowed. 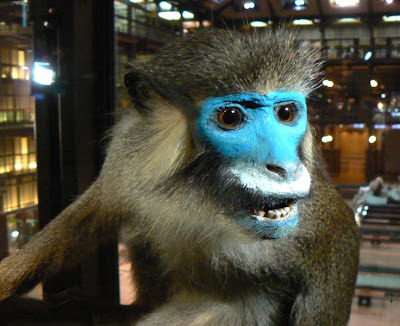 A blue-faced monkey. I don't remember the exact name of the species. I made my way to the upper levels so that I could get a good photo of this spectacle. The upper levels wrap around the main hall. One side is where all the access is (stairs, elevators) and the remaining three sides are filled with exhibits. My quick climb up was rewarded with having the upper levels virtually to myself. 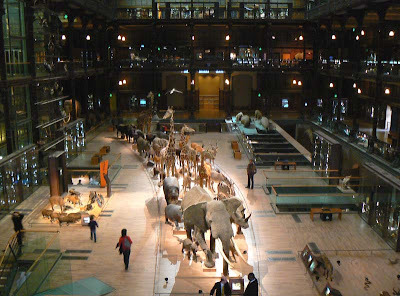 There's a separate hall of extinct and endangered species; I was the only human in there. There were also exhibits on the beginnings of life on earth, a little about how river habitats evolve, reproduction, plant and fungus evolution, birds, reptiles, monkeys, just about everything. Down below the main level were the exhibits related to fish and marine species. There was a special whale exhibit in the basement, but that seemed geared more toward kids and was less interesting to me. The light was very dim throughout, and flash photography was not allowed, so many of my photos came out blurry. But some worked, and these are they. Next time, tripod. I could have spent much more time there, but I also wanted to wander a bit outside in the gardens before meeting my lunch date. I got a good taste of the museum and will definitely go back some day. *The museum pass didn't cover this museum, so I had to pay.